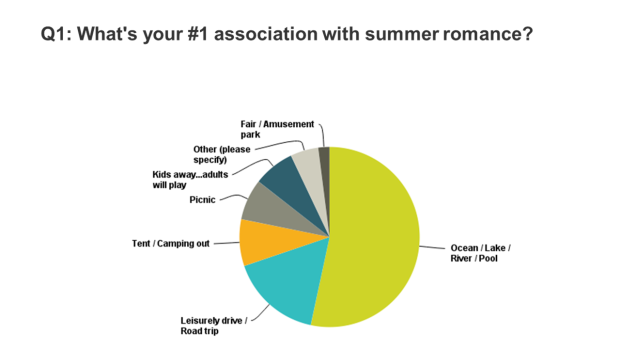 What does summer romance mean to you? I polled thousands of readers of my Wild at Heart newsletter. Here’s what they said. Over 50% have a romantic association with an ocean, lake, river, or pool. Does that ring true with you? Where did you get your first summer kiss? In a boat? By the pool when your parents weren’t watching? In the water? Or maybe it’s a being in a car that makes your heart go pitter patter. 16% of respondents said they loved to take a leisurely drive or a roadtrip. Some people in the other category chose “me time” or “just at home relaxing.” That sounds perfect! Whatever you do this summer, I hope you have the chance to get out of your normal routine. Making memories is all about doing something out of the ordinary. Maybe this list will inspire you to take a plunge, start the engine, or pitch a tent. Whether you love to soak up warmth and sunshine or hide inside with the air conditioning blasting, whether you are alone or with your special someone, I wish you the time to make this summer exactly what you want it to be!